Kazakh soil during the totalitarian regime. The story sometimes presents paradoxes. Far from Europe, the Asian country of Kazakhstan, with a harsh climate - from exhausting heat to severe frosts, where in previous centuries rebels exiled, became the second homeland for many peoples. There were also Polish people - proud and freedom-loving, who almost lost their statehood in the old days, but managed to preserve national uniqueness. The history of Polish settlement in Kazakhstan began when the tsarist Russian government started to exile its political opponents from Poland, who then fell under the protectorate of Russia, to the Kazakh steppes. But the very first Pole, who arrived in the land of Kazakhs, was in the 13th century Franciscan monk, Benedictus Polonus, who left the world's first description of the eastern lands, which at that time in Europe had a very vague idea. The monk was on an expedition of the ambassadors of Pope Innocent IV, who sent a diplomatic mission to the Mongolian Batu khan. Poles in Kazakhstan are one of the widely spread ethnic groups in Kazakhstan. Part of the Polish diaspora world is called Polonium. Current census of the population of Kazakhstan showed the presence in the country of thirty five thousand Polish residents. The Poles live more compactly in Northern Kazakhstan (North Kazakhstan, Akmola, Kostanay regions). It is worth noting that North Kazakhstan region is characterized by the maximum concentration of Poles. The Polish community of Kazakhstan today almost completely consists of people born on the territory of the republic in the Soviet and post-Soviet periods. For most Poles in Kazakhstan, the Russian language is native. Unlike other Slavic groups of the republic (Russians, Ukrainians, Belarusians), there was no mass emigration of the Poles in the post-war period, so their share in the region has even increased, although their number is decreasing due to natural decline. The Polish community consists of two parts - the voluntary-resettlement wave of the late 19th century and the beginning of the 20th century and the deported part (mostly Poles of Ukraine and Lithuania exiled here in the 1930s by Stalin's regime). This has had a considerable impact on the positive development of Kazakh-Polish relationships. If we proceed from the modern history of our states, then it will be right to date the beginning of official Kazakh-Polish cooperation on April 6, 1992, when diplomatic relations were established. In the future, a strong stimulus to the development of bilateral contacts in all spheres of interaction was given by mutual visits at the highest level. The head of state visited Poland in November 1997 and May 2002. In turn, reciprocal visits to Kazakhstan were made by the Presidents of Poland A. Kwasniewski in October 1999 and Lech Kaczynski back in March 2007. It was then that solid juridical and legal bases of cooperation were laid, which still determine the positive direction and high dynamics of the Kazakh-Polish relations. Currently, between our countries there are 18 international treaties. At present, when the past and future of the Polish diaspora in Kazakhstan have been the focus of researchers, when sometimes incredible and unrealizable ideas and proposals are born, when diplomatic relations between Poland and Kazakhstan have just been established, exhaustive coverage of Polish-Kazakh relations can not be delayed. It is therefore important that in the forthcoming period we maximally expand and deepen our knowledge of Polish-Kazakh relations, which have been going on for more than one century. It is also important for the Kazakh public to understand that the Polish diaspora in Kazakhstan is not at all the result of the expansionist, colonialist policies pursued by the Polish government. It must be constantly emphasized that the Poles in Kazakhstan are a consequence of direct intervention by tsarist Russia and the Soviet Union in the internal affairs of Poland, the distinctive feature of which has long been national oppression, deportations and exile to camps. During more than two hundred years of Polish-Kazakh contacts, none of the Poles came to Kazakhstan at their own volition in the framework of the emigration and political events of the Polish government. With this fact it is necessary to be considered separately, including at the present stage, during formation and formation of the Polish-Kazakh relations based on the sovereign political course of both independent states. This can not be forgotten in the sea of ​​all possible confusions and emotional underpinnings, when simplified, soon-succesful conclusions and conclusions are made so easily and carefree. As a result of the signing of the Riga Peace Treaty, enslavement of the Polish population residing in the former Soviet Union by the totalitarian Soviet state was manifested, in particular, in numerous references to the camps and deportations. This was the main reason for the formation of the Polish diaspora in Kazakhstan. Similar phenomena occurred in Kazakhstan in the 1930s, when thousands of Kazakhs died, and many were sent to the camps of Vorkuta, Norilsk, Kolyma, Karaganda and Siberia. In the modern Kazakh history, the first studies devoted to this issue have already begun to appear. It is also reflected in the Polish so-called "camp literature." It turns out very often that at that time the fate of the Poles and Kazakhs was identical, which in no case should be forgotten. The closer relations of Poland and Kazakhstan are a likely possibility, a chance to preserve all this in human memory. The Poles were not in Kazakhstan of their own free will, they did not come here to master the virgin lands of Kazakhstan. They came here under the threat of death. Examples of this kind of understanding on the part of the Kazakh population are the reasons for the mass deportation of Polish special settlers. In their memoirs, they repeatedly emphasize that thanks to the help of ordinary Kazakhs they were able to survive the famine and cold of the steppe region. Most of the deportees were sent to remote and uninhabited steppe areas in the north of Kazakhstan. And only a few were in southern Kazakhstan. Reflecting the placement in 1936 in Kazakhstan of deported Poles is a modern map of the settlements of Polish special settlers. In the 1930s, resettlement to Kazakhstan was not the last. At the very beginning of the Second World War, after the Soviet Union seized the eastern lands belonging to the Commonwealth, another wave of deportations and relocations came. Already in 1940, numerous convicts were sent to Kazakhstan. According to preliminary estimates, in those years almost 200 thousand Poles were deported, who were sent to Akmola, Aktobe, Kostanay, Pavlodar, North Kazakhstan, Taldykorgan, Zhambyl and Almaty oblasts. After the conclusion of the Polish-Soviet pact through Kazakhstan, thousands of Poles wishing to fight in the ranks of the Polish army were led by Vladislav Anders. These soldiers were the first to leave the Soviet land. After the end of military events, the Polish special settlers had a hope to return to their homeland. This and other topics were covered during Arman Suleimenov's interview with Selim Khazbievich, current Polish Ambassador to the Republic of Kazakhstan. It has been more than a year since Selim Khazbievich took up on this position at the Polish Embassy in Kazakhstan. During his tenure, it took some time for the diplomat to adapt in Astana. The biggest problem was, in fact, the local food. Polish cuisine has its own traditions and characteristics. In Poland, for example, there are vegetables that one would struggle to find in Kazakhstan, or are very rare. Poles eat, first of all, a lot of fruits and vegetables, if meat, then lean. It was difficult for the diplomat to get used to Kazakh food. With all due respect to Beshbarmak - after it the European organism comes to the senses for two days. But the ambassador and his wife really like koumiss. During Selim Khazbievich's interview with National Digital History portal, he noted that the bilaterial economic relations are of high importance nowadays. First, Kazakhstan is a country rich in natural resources, which are of interest to the Polish economy, for example, coal, oil and even metals, which are used by the electronics industry. Secondly, there are more than hundred different Polish enterprises operating in Kazakhstan, the number of which might increase. Last year, trade and commodity exchange between our countries amounted to 1 billion 242.7 million euros. The Ambassador hopes that the turnover will grow and reach two billion. According to the Ambassador Kazakhstan is an extremely attractive and interesting country. Kazakhstan is the largest country in Central Asia, both politically and geopolitically. It can be claimed that Kazakhstan is the most geopolitically important amongst Central Asian countries. ''We are thinking of going out through Kazakhstan to the eastern markets. We would like to see Kazakhstan become a Polish hub in the South-East Asia in the future'' said Selim Khazbievich. Moreover, Poland was noted as being an important gateway for Kazakhstan to Europe. ''Many Kazakhs communicate in Russian, which is similar to Polish too. Poland also has the experience of a communist country, may not be as rich as the Soviet Union, but they have known these conditions that existed during communism, and we can help Kazakhstan enter the capitalist market of Western Europe. The Polish Embassy is working not only to increase economic ties. The Polish side is also working on the strengthening of political ties between the two countries'' claims the diplomat. Now the bilaterial cooperation is developing in the United Nations Security Council. 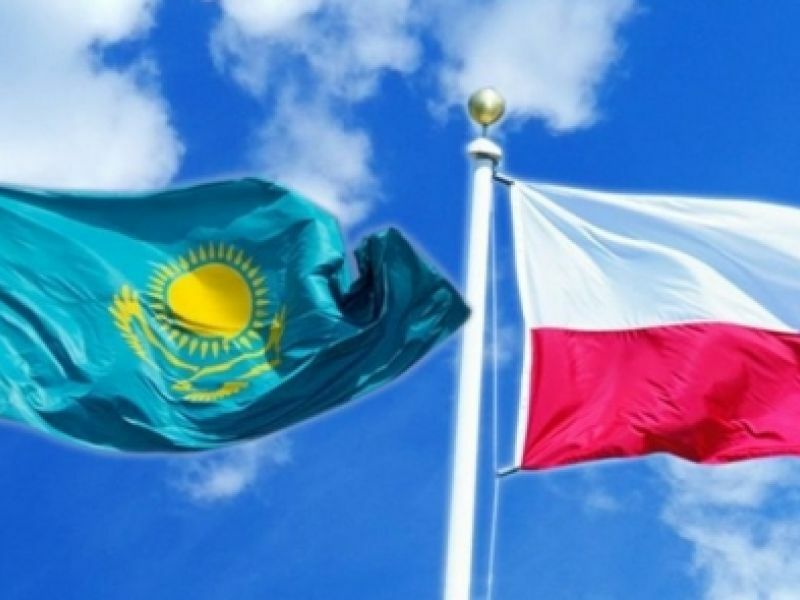 Poland supports Kazakhstan's resolutions in the UN and will be able to provide political support to other organizations, such as the OSCE, so that Kazakhstan takes a confident position worthy of the great country of Central Asia. It is noticeable how Kazakhstan is developing, in comparison with other countries of Central Asia. Of course, the development of the capital of Kazakhstan - Astana from the capitals of other states of Central Asia is favorably different. It is clear that Kazakhstan is a country of the future. In the history of Poland was a difficult period, when the country of 123 years was under the rule of three states: Austria, Prussia and the Russian Empire. This period is called the occupation of the Polish state. In 1768 the Polish rebels opposed the Russian tsar and proclaimed the Confederation. They fought for four years against the Russian troops in Poland. The Confederation fell and the rebel Poles were exiled to Siberia. ''This was the first wave of exiled Poles. Karl Lubich Zalessky was amongst them and got exiled to Kamchatka. His route passed through the Kazakh steppes, today's northern Kazakhstan. He was the first to describe the Kazakh lands in the 70s of the 18th century, the conditions in which Kazakhs lived, meetings with Kazakh tribes, their customs. This, you can say, the earliest sources about the Kazakhs in Polish literature. The first source of the Kazakh steppes in Polish literature was an essay by the famous Polish romantic writer of the 18th century Jan Pototsky. He visited the northern shore of the Caspian Sea and wrote a report. Polish aristocrat Pototsky wrote in French, as in those days it was fashionable. The traveler was the first of the Polish writers who collected materials on modern North-West Kazakhstan. His essay "Journey to the Astrakhan Steppes and the Caucasus" was published in French in the second half of the 18th century'' said Mr.Ambassador to Arman Suleimenov. When it comes to to the 19th century, Arman Suleimenov notes that the Poles were exiled by the tsarist regime to Siberia and found themselves in the territory of modern Northern Kazakhstan. They strongly supported the Kazakh national and ethnic identity, collected folklore, like Adolph Yanushkevich and Tomasz Zan. It was a period of romanticism in Polish literature, in the literature of European countries, and Polish romanticists, poets and writers, also engaged in politics. For their progressive views, they were exiled, as they used to say, "to the soldiers." The Russian authorities sent soldiers to the Orenburg line, to the border with Kazakh juzes. It used to be that they were friends with Kazakhs. Adolf Yanushkevich, a close friend of the famous poet Adam Mickiewicz, Tomasz Zan, Gustav Zelinsky in the 30-40s of the 19th century collected Kazakh folklore, wrote about the Kazakh traditions. In the early twentieth century, after the formation of the Polish state in 1918, Marshal Pilsudski supported representatives of the Kazakh political migration. There are still around 35 thousand people who consider themselves Poles, although they almost do not speak the Polish language. But there remained a historical memory, and Poles have preserved their identity. The Polish side is doing its best in providing high quality education and teaching the Polish language. They support those who wish to return to their homeland of their ancestors. Nobody asked any Kazakhs, Poles, or other ethnic groups, whether they want to live here or not. It was a totalitarian policy, the consequences of which are still visible. Kazakhs also became victims of the policy of Russification, Sovietization. Independent Kazakhstan does not stand in one place, but confidently goes forward, becomes an active participant in the world economic process, participates in world politics. But Kazakhstan managed to get out of this, one might say, political hole. With the advent of independence, thousands of Poles returned to their historical homeland in Poland. Some Poles left for Siberia, Kaliningrad and other cities of Russia. The Polish leadership did not deal with migration issues systematically, like Germany. Only with the arrival of the ''Prawo i Sprawiedliwość" party of Mr. Kaczynski, this problem was put on the state level. The fate of former Kazakh Poles has developed in different ways. Not everyone could find a place for various cultural, family, language reasons. Most migrants have adapted well in modern Polish society: they have studied the Polish language well, graduated from schools, universities, and got a job. Among them there are businessmen, private entrepreneurs, civil servants. There was a special place for the Kazakhs in the Polish society. Recently, there has been an increased interest in the repatriation program among Polish diaspora in Kazakhstan. According to the Polish consulate in Astana, there are data of about two thousand people who collected relevant documents and are currently waiting for an invitation from Poland, as well as providing them with conditions for living and working in Poland. According to their estimates, the number of people of Polish nationality who are interested in moving to Poland. The approaches of both Kazakhstan and Poland towards the issues of ensuring regional and global security, fighting the main challenges and threats of the present are close or almost identical. The two sides are making sure to support mutual international initiatives. For example, Polish government supported the main priorities of Kazakhstan's chairmanship in the OSCE and the candidacy of our country for hosting EXPO-2017 in Astana. Within the framework of the Astana Economic Forum in May 2016, the Agreement on Poland's participation in EXPO-2017 was signed. A number of strategic documents including President Nazarbayev's "100 concrete steps", the Development Strategy "Kazakhstan-2050", the State Program "Nurly Zhol", the Manifesto of the President of Kazakhstan "The World. ХХІ century", are all published in Polish. Poland highly values ​​our achievements in the international struggle for a nuclear-free world and counts on close cooperation in the joint implementation of our agenda as a non-permanent member of the UN Security Council for 2017-2018. Indeed, the range of bilateral interaction with Poland is extensive. Nowadays, the Kazakh-Polish relations are highly understood and mutually complementary, devoid of any political or economic problems. There is no sphere where our countries do not cooperate. Today, Kazakh-Polish relations successfully develop in political, interregional, scientific, cultural, humanitarian, sports and other spheres. Naturally, the priority of cooperation with Poland is economy, investment, industrial-innovative and transit-transport spheres. Kazakhstan and Poland are not only the largest states in Central Asia and Central Europe respectively, but also economic leaders in their regions. So, Poland is the 5th economy of the European Union. In turn, Kazakhstan occupies the second position among the states of the Eurasian Economic Union on economic potential. For our country, Poland is one of the leading foreign economic partners in Central and Eastern Europe. At the same time, Kazakhstan accounts for about 70% of the Polish trade turnover with the countries of Central Asia. One should also bear in mind the mutual interest in the joint use of the transport and transit potential of the two states. It is no secret that the shortest overland route from Asia to Europe passes through the territories of Kazakhstan and Poland, implementing the initiative "One Belt - One Way", which unites the projects of creating the Economic belt of the Silk Road and the Silk Road of the 21st century. Polish authorities are interested in opening direct flights between Warsaw and Astana. Presidents have the opportunity to meet not only during mutual visits. So-called working meetings can also be held. For example, on the margins of the jubilee 70th session of the UN General Assembly in New York in September 2015, the first meeting between the President of Kazakhstan Nursultan Nazarbayev and the President of Poland, Andrzej Duda, took place. As a result, the head of our state was invited to pay a visit to Poland. Thus, in late August 2016, the President of Kazakhstan, Nursultan Nazarbayev, made the first state visit to Poland in the history of our relations. The very status of the visit highlights and demonstrates the high respect of Poland to our country and its leader. For Poland and the entire EU, Kazakhstan is an important economic partner in the Asian continent, both commercially and in terms of investment. Kazakhstan signed the Agreement on Extended Partnership and Cooperation first, proving the importance and role of the republic in building such ties. It is quite symbolic that Nursultan Nazarbayev became the first world leader who visited Poland after the NATO Summit in Warsaw and the historic visit of Pope Francis Francis, as well as the first Head of State who visited Poland, who is the initiator, co-founder and active member of the Eurasian Economic Union. We hope that the economic and investment topics, the issues of intensification of cooperation in the fields of agriculture, transport, transit, construction, chemistry, energy, municipal services and many other areas will prevail on the agenda of both countries.